Joseph B. Herzog is an Assistant professor in the R.B. Annis School of Engineering at the University of Indianapolis. He chose to come to the University of Indianapolis because he is passionate about teaching, is excited about the direction of the new R.B. Annis School of Engineering, is glad to return to his engineering roots, and is happy to be close to his extended family. 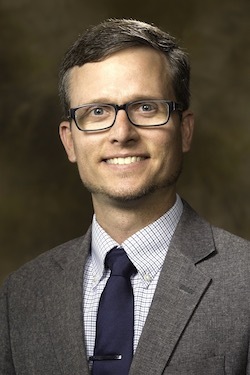 Previously he was an Assistant Professor in the Department of Physics at the University of Arkansas. He is truly grateful for his time at the University of Arkansas, and enjoyed his department, students, and the campus. While in Fayetteville, he also served as a faculty in the Microelectronics-Photonics Program and the Institute for Nanoscience and Engineering. He received his PhD from the University of Notre Dame working in the Nano-Optics Research Lab with J. Merz and A. Mintairov. After this he was a Welch Postdoctoral Research Associate, researching plasmonic nanostructures at Rice University with Douglas Natelson in the Department of Physics & Astronomy. In the summer of 2017 he was a Fellow at the U.S. Naval Research Laboratory (NRL) in Washington, DC working with Jake Fontana on tunable subnanometer gap plasmonic metasurfaces as part of the Office of Naval Research Summer Faculty Research Program. At the NRL he worked in the Center for Biomolecular Science and Engineering, which is a division of the Materials Directorate at the NRL. His experience also includes working for Intel Corporation both in Hillsboro, OR and Santa Clara, CA; and he worked at the Berliner Elektronenspeicherring-Gesellschaft für Synchrotronstrahlung m.b.H. (BESSY - Berlin electron storage ring company for synchrotron radiation) in Berlin, Germany, researching ultra thick high-aspect-ratio microfabrication. His research focuses on nano-optics, including plasmonics, nanofabrication, computational modeling, and photonic crystals.